The Food Alphabet and More: Summer Giveaway #2 - Ace Water Spa Luau party tickets - Winners update! Summer Giveaway #2 - Ace Water Spa Luau party tickets - Winners update! 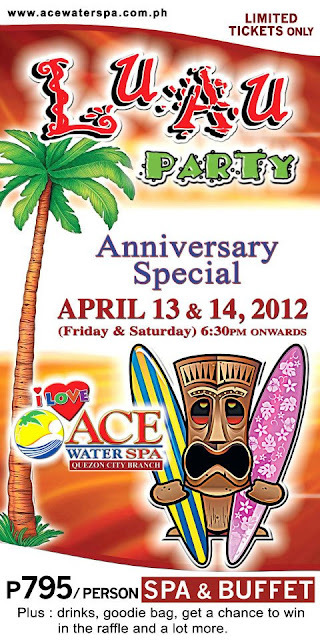 Luau Party at Ace Water Spa! Please check your FB messages to know how to claim your prize! Thanks to all who joined! And watch out for more! Yes it's summer!!! And its the best time to visit Ace Water Spa! Summer fun is definitely for the kids, after a school year of hard work, don't they deserve a break? Let's give our children a summer they will always cherish. Ace Water Spa, the only one of its kind will be having a Luau Party on their 7th Anniversary celebration. So what's in store for you at the celebration? For the price of only P795/head, you get to party at the Luau party and enjoy a 4-course meal buffet, and a Spa ticket (valid for 2 months from date of party) with bottomless iced tea and cocktails, goodie bags, raffle prizes. A photo booth for memories to keep, a live band to entertain us guys, Ace mug giveaways and a FREE Ace promo calendar (with coupons up to P12500 worth of savings from May - December, given away for a P2,000 purchase, but with this Luau Party, it's yours for FREE). What's more is that when you buy 4 tickets, you get another 1 FREE!!! So let's go to the fun part, The Food Alphabet and More will be giving away 2 adult tickets to 2 winners! And if you do win, I shall inform you on how you would be able to claim your ticket. Here's how to join. Must be a follower of The Food Alphabet via GFC (Google Friend Connect) - please click on the join this site on the right sidebar of this post. Must like Ace Water Spa and The Food Alphabet and More on Facebook. Click Share on Facebook on the left side of this post. Copy this message on your Facebook share with the proper taggings. Please make sure you have tagged The Food Alphabet and 3 of your friends. Post your Facebook url post on the comments section below this post with your name and email so I may contact you in case you win. Winners will be picked by random. 2 winners will win 1 adult ticket Luau Party each. This giveaway starts today until April 11, 2012 midnight only. So Join up! Please visit Ace Water Spa on Facebook. You may reach them at 330.7776 / 404.9995 / 352.1660 for any inquiries and ticket reservations. comments closed... will reveal the winners in a while.